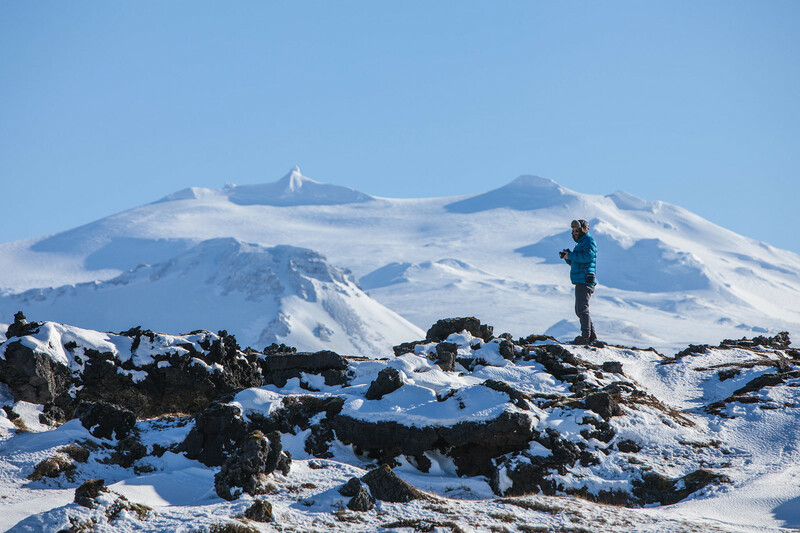 This winter adventure to Snæfellsnes is packed with famous attractions and stunning nature. This 2-day short break will take you around the magical Snæfellsnes peninsula. The area’s diverse and dramatic landscape will give you a taste of the amazing variety you can find all over Iceland. The most dominant feature in this region is the mighty Snæfellsjökull Volcano, topped by a glacier. On the northern side, you will find charming little fishing towns, like Grundarfjörður and Ólafsvík, as well as lava fields, beautiful black and golden beaches, and picturesque mountains, like the much photographed Kirkjufell. The end of the peninsula is home to a national park. There, you will visit the lava cave Vatnshellir and the pebble beach Djúpalónssandur, which is surrounded by gorgeous rock formations. The south side is packed with natural wonders. See the little beach in Hellnar and the breathtaking basalt columns and cliff formations. Marvel at the beautiful natural harbor at Arnarstapi and don’t forget to visit the old little black church at the hamlet of Búðir. On the way back to Reykjavík, we take a detour into the valley of Borgarfjörður. There, you will view the spectacular waterfalls Hraunfossar and the hot spring Deildartunguhver. This tour fits with our Ice Cave and Northern Lights tour to south Iceland ,so you can create a 4 day itinerary by booking both tours.